RMK Rose Cleansing Balm // This is the first full size tub of this cleanser I've gone through but I have also used a decent sized sample tub as well. I first came across this cleansing balm when it was included in a beauty box and I fell in love with it straight away. Unlike some balm cleansers, this feels really light on the skin and as it emulsifies with water, it never leaves your skin with a greasy feeling. The rose scent is lovely and my skin just seems to get on really well with this cleanser. It feels very gentle on the skin and I'm sure I'll be buying another tub again at some point. balance Me Skin Bright Hydrating Face Mist // I really love this face mist and I used it as my daily hydrating toner. The reason I bought this was because the REN Tonic Moisture Mist was sold out, and still is, and I thought it looked pretty similar and they are. It's a very hydrating toner thanks to the hyaluronic acid but the only downside is that I finished it up pretty quickly. I have a long list of other toners I want to try first but I know I can always rely on this and will buy another bottle again. Trilogy Sensitive Skin Very Gentle Calming Fluid // I really enjoyed using this and am sad to see it finally empty. I have been using this as my serum, morning and night, and then following up with a moisturiser. I'm not sure if this is how you're meant to use it but it's been working for me. I have very sensitive skin and this has worked wonders. It contains calendula which is what I've learnt my skin likes so I tend to try and find products which contain it. If you don't have dry skin but still very sensitive this might work well as a light moisturiser especially if you have greasy skin. I seem to always say this and it's probably because I like to hoard and constantly buy new products but I have other serums I need to use first before buying anything new but I would buy this again. The name and packaging has changed but I'm pretty sure it's still the same product. The new name is Very Gentle Calming Serum but I think I prefer the pump of the old packaging instead of a pipette. Caudalie Vinosource Moisturising Sorbet // This is the first full size tube I've finished but like the cleanser I've been through a couple of larger sample tubes of this moisturiser. It has a very unique texture, it sort of feels like a gel but light and fluffy which means it is a dream to apply and sinks into your skin immediately. It feels very light on the skin so was perfect to use during the summer when I still needed a lot of moisture in my skin but didn't want to feel like I had just applied a thick cream. The scent of this is just amazing! I probably wouldn't buy this again straight away as I tend to need something a little thicker in the winter but I'd definitely get it again for next spring/summer. 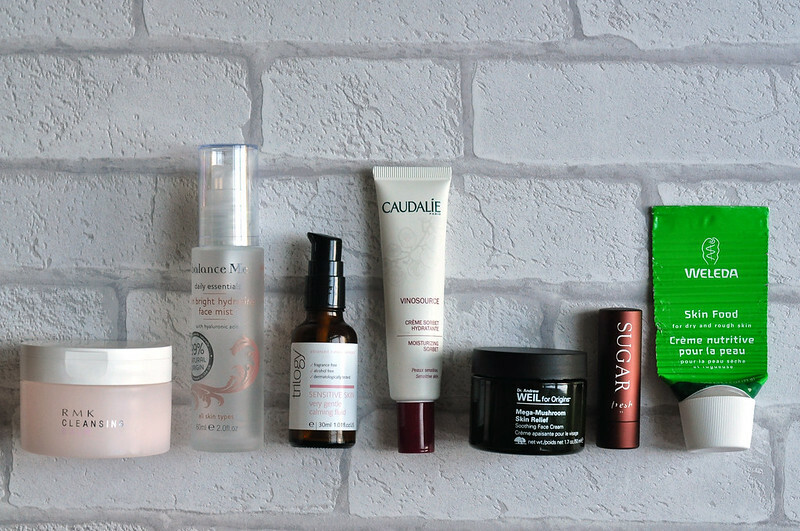 Origins Mega Mushroom Skin Relief Cream // This month is the month where I've finished nearly all the skin products I was using and even a second moisturiser. I finished the Caudalie moisturiser very early on in the month so I was using this one from Origins for the majority of October. I've got mixed feelings about it as I loved it when I tried a sample of it and when I bought it but recently I've just not been loving it. I've liked it enough to keep on using it and my skin has liked it, I just haven't been wowed by it like I did when I first tried the sample. I don't think I'd buy another tub again although moisturiser is the one product I struggle to find that I like. Fresh Sugar Lip Balm // Luckily I have a mini tube of this otherwise I would have to go and buy another tube despite having a million and one other lip balms. This is up there in my top three along with Dior Creme De Rose and By Terry Baume De Rose and I couldn't pick a favourite. It is in a tube which makes it easier to apply so perhaps it is my favourite. I love everything about it, the scent, the packaging and how it makes my lips feel is amazing. It's not cheap but worth every penny. It's also lasted me a really long time although I have lost it several times but then always found it again a few weeks later so is probably why. Weleda Skin Food // This is one of those products that I know I'll always have a tube of in my skin care stash and I don't know what I used before I discovered it. If you have dry skin and/or eczema and haven't used this then you need to buy it straight away. It's a really thick cream that works miracles on dry skin. This has helped patches of dry skin and eczema before when nothing else would work. A little goes a long way and I haven't had any problems with breaking out when using it on my face either. It's available in a few different sizes and I have tubes of them everywhere. I have a tiny tube in my hand bag, travel bag, by my bedside table and one with the rest of my skin care. I already bought a new tube before I'd even finished this one just so I wouldn't be without. Plus the packaging is metal and means I can use my tube squeezer! Also the scent sort of reminds me of chocolate orange. Lush Snow Fairy Shower Gel // I have finally come to end of my Snow Fairy stash that I stocked up on the Christmas before last. And yes it took me that long to goes through all the bottles I bought! Despite using and buying this shower gel for as long as I can remember, I am still not sick of the sickly sweet scent and will be buying another bottle this Christmas. I probably wont go crazy again and buy lots in the sale but I'll be happy to have another bottle in my bathroom cabinet. Nivea Diamond Touch Shower Cream Oil // This was one of those shower gels I picked up in Asda simply because it was on offer, smelt ok and I needed it. It's nothing special and was nice to use but I wouldn't rush out to buy it again like I would others. L'Occitane Almond Shower Oil // This one the other hand, I really need to go out and buy another bottle of! I can't believe how long this huge bottle has lasted though, I think I've had it for about two years and luckily it hadn't gone off despite the twelve month expiry date. I use this as a simple shower gel when I want something a bit more moisturising, as a bath oil and to shave with. The almond scent is amazing and it emulsifies into a very luxurious feeling lather. I'm going to buy the smaller sized bottle, I don't even know if you can buy this large bottle as I got it in a gift set, and probably just buy the refill bag when I need to. The pump was really handy but as I've had this bottle for such a long time it's gone a bit horrible looking. REN Rose Otto Shower Gel & Body Lotion // I really liked this shower gel and being able to follow up with a body lotion in the same scent. I would like to buy both of them again but they're not the cheapest. I'll probably look out for another gift set in the sale which is where I got these two from and a few other products. The Body Shop Honeymania Body Scrub // I really wasn't a fan of this body scrub and am glad to see it empty. The body scrubs from The Body Shop really vary in how good they are and how abrasive they are. This unfortunately despite the lovely floral scent is one of the bad ones. It was a really thick paste that when you applied it, didn't really have any exfoliating particles in it so it just felt like I was using a shower gel. Needless to say I won't be buying this again and will probably stick to Soap & Glory body scrubs in the future. Taylor Swift Taylor Perfume // I do get attached to my perfumes and scents especially if I use them everyday and over a long period of time like I have with this one. I also got a lot of people at work asking what perfume I was wearing as they really liked it which is always a good sign. It smells like it's more expensive than it is which I like. I would buy another bottle especially if I found it on offer. Maybelline Big Eyes Mascara // I was really disappointed with this mascara and only used it a handful of times. It was extremely dry which made it really hard to work with and apply. I also found that the brushes are too close to the handles which made it really awkward to apply. Soap & Glory Hand Sanitiser // I always have a bottle of hand gel floating around either in my handbag or in my dressing table drawer and this one from Soap & Glory is my favourite. It smells great and gets the job done. I'm currently using a few different scents from The Body Shop but once they're finished I'll be repurchasing this. The only downside I find is that quite a lot of gel comes out if you're not careful. 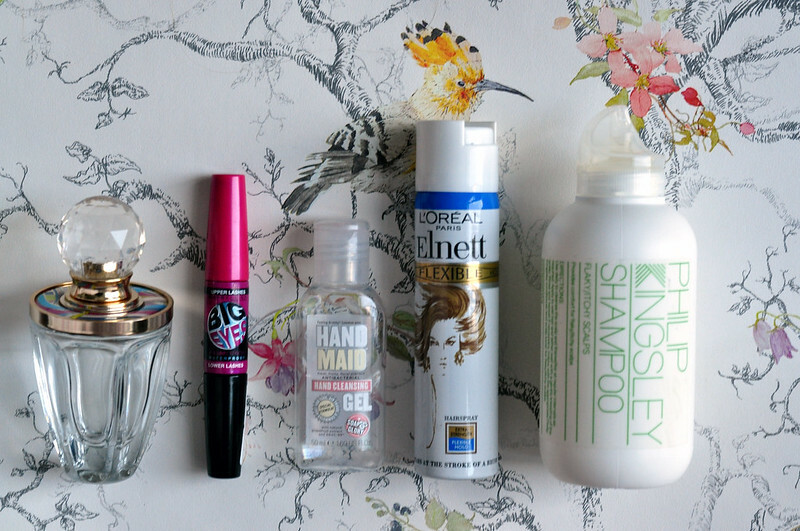 L'Oreal Elnett Flexible Hairspray // I'm not too fussy when it comes to hairspray and as long as it doesn't leave me hair feeling too crispy and holds a curl then I'll use it. I would buy the full size of this one from L'Oreal and I also like that you can buy mini bottles as they're perfect for travel. Philip Kingsley Flay/Itchy Scalp Shampoo // I've been through countless bottles of this shampoo that I've gone ahead and bought the one litre bottle so I can save myself a bit of money. The larger bottle is expensive, about £50, but it saves you about £30 overall which is great. Instead of having the large bottle in my bathroom, I've just been filing up this old smaller bottle to keep in my cabinet. This shampoo is perfect if you have eczema on your scalp, like I do, and tend to react to other shampoos. So many empties! 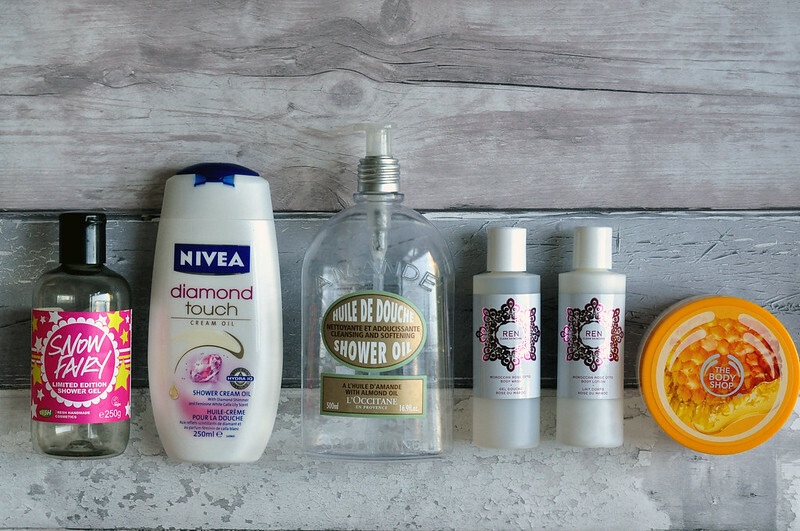 I also tried L'Occitane almond oil shower gel and Caudalie Cream and I liked them a lot! The Fresh sugar lip balms look so, so incredible!